GELATO ALLA PANNA CON PRALINA AL CARAMELLO SALATO. I must confess I generally am not a fashionable cook. On the contrary, I am a firm believer in tradition and repetition. The simpler a recipe, the better. And, if it’s been invented already and everybody knows it, then I am probably not going to be able to improve it. I have been ignoring fusion food of any provenance for years. Soy sauce on foie gras? No thanks. Lobster ice cream? Rose flavored salt? mpf……..
Then I met salt and sugar. Years ago, before everybody – including Obama – started to be crazy about salted caramel. We were on a Thai island, guests of an adorable local family, preparing a dessert of sticky rice boiled in coconut milk and palm sugar. The whole experience was fantastic. However, what it’s been impressed in my memory was how a sprinkle of salt changed and improved the taste of the coconut and sugar combination. No news, you will say. We have been adding salt to cakes forever. Indeed, it’s a tradition. I had forgotten and I had to get all the way to the other side of the world to remember. In a small skillet over low heat, toast the almonds with 2 tablespoons sugar and a pinch of salt. Keep stirring to coat the almonds with the melted sugar. Continue for a few more minutes until nuts caramelize to a dark brown color, about 5 minutes. Spread them out on a non-stick surface to cool. When cooled, pulverize in a food processor or chop finely to obtain a praline. Heat the milk with both brown and regular sugar. Stir to dissolve, add the cream and refrigerate for at least one hour. This will shorten the churning time. Process the creamy mixture in an ice cream maker according to manufacturer’s instructions. When the mixture is set, sprinkle in the praline and process until it hardens further. Keep in the freezer until ready to serve. Please note that I like my gelato to be egg-free and a relatively modest in sugar. As a consequence it melts quickly. That is, if you can wait long enough before polishing the bowl. Yummmmm!!! I’m going to make this today even though it’s winter here and really not gelato weather at all. Thanks for the inspired recipe, it looks easy too. Love salted caramel too, in little bits, because salt and sugar in bigger doses are such health hazards. Shame! Thanks Heather. I must say I love ice cream any time of the year. My recipe only has one pinch of salt, you hardly taste it but it brings out the flavor of the caramelized nuts. Letizia, my friend Gina always reminds me of the importance of seasoning sweets with salt. It took me awhile to get my palate around it but I have to say that I am also a convert. I need to buy an ice cream maker because this very much appeals to me, and would appeal to Micha as well. How are you darling? I hope your season is going well. Don’t melt in this heat! Now you have Tea home with you and some lovely ice cream to celebrate with . Love from the great white (sizzling hot) North. 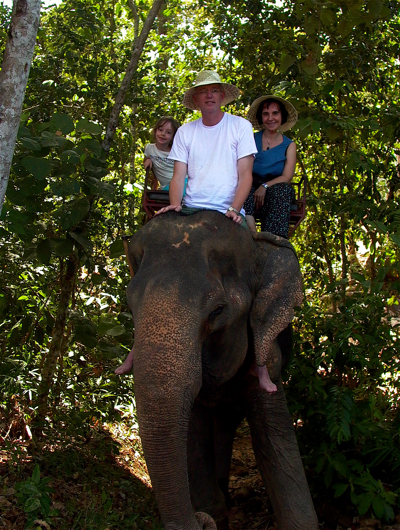 Very interesting — and a wonderful photo of you, Ruurd, and Tea on the elephant!!!! I’m still getting my head around the concept of salt and sweet together. Clearly, I’m going to have to do some research! Thanks, Letizia, for this nice recipe. Trying it today for my Grandson’s birthday! wonderful I hope he liked it!